Best Literary Remix: "Word for Word is all about the story". 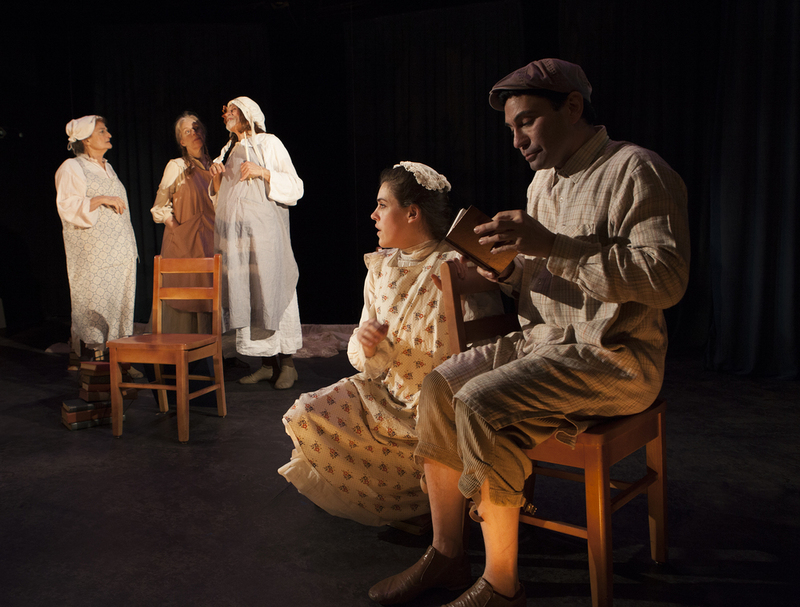 WORD FOR WORD Performing Arts Company is an ensemble whose mission is to tell great stories with elegant theatricality, staging performances of classic and contemporary fiction. Co-Artistic Directors JoAnne Winter and Susan Harloe founded Word for Word Performing Arts Company in 1993 as part of the Artists in Residence program at The Z Space Studio (Z Space's original name). The very first performance, to a packed audience in a rehearsal space on Howard Street, was Dorothy Parker’s “The Standard of Living.” It was directed by Amy Freed and featured John Balma, Susan Harloe, and JoAnne Winter. Top Left: Velina Brown, Edris Cooper, Margo Hall, Khary Moye in "All Aunt Hagar's Children" | Rosie Hallett, Rudy Guerrero in "Night Vision" by Emma Donoghue | Velina Brown, Jia Taylor in "All Aunt Hagar's Children"
After early performances in public libraries and schools, Word for Word soon began performing short stories on stage, quickly becoming a local theatre favorite. In 1994, Word for Word became a program of Z Space and has maintained popularity ever since. In 1998, they established an arts education program known as YOUTH ARTS employing the Word for Word style of in-depth, literature-from-the-inside-out workshops in Bay Area schools. In its vibrant history, Word for Word has performed over 70 stories by some of the world’s best writers. Many of these stories have been performed in front of the authors themselves. They perform regularly at Z Space since 1996 have toured annually throughout California and France. In 1997, Word for Word received a special Bay Area Critics Circle Award for its unique concept and in 1998, 2002, 2003, and 2005, the Bay Area Critics Circle awarded the company numerous honors for productions including “The Halfway Diner,” “Winesburg, Ohio,” Stories by Tobias Wolff,” and “Immortal Heart.” In 2008, Word for Word received the Best Ensemble Award for “Sonny's Blues,” with composer Marcus Shelby receiving the best Original Score for the production. Word for Word's Associate Artists Group is a coterie of talented young theater professionals who are bringing Word for Word to a new generation of audiences. The following writers have had their work performed by Word for Word, and lend their names in support the work of our company.